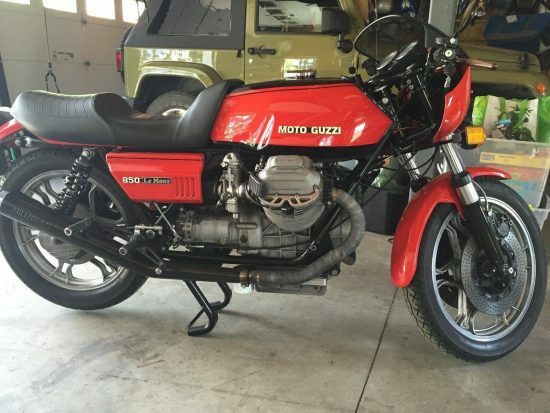 Moto Guzzi’s follow up to their successful V7 Sport was this, the 850 Le Mans, often known these days as the “Mark I Le Mans.” It used a hot-rod version of their earlier longitudinally-mounted v-twin engine, with bigger, high-compression pistons, bigger valves, high performance carburetors, cast-aluminum wheels, and a more modern, very chunky look that would set the tone for Guzzis through the 1980s. The style is really hard to pin down to a particular era, with the jutting cylinders and minimal style looking like something very 60s or 70s while the angular bodywork has more of a 1980s style. The hot-rod engine put out 71hp at the rear wheel and made for a genuine 130mph, which wasn’t top-of-the-class but very competitive during the period. 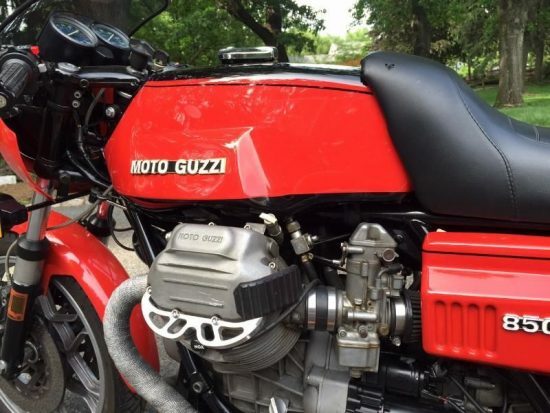 But unlike the equally fast but fiddly-to-maintain Ducati 900SS or the wobbly-handling and under-braked Kawasaki Z900, the Le Mans offered up Guzzi’s classic recipe of durable shaft-drive, stable handling, and midrange grunt. 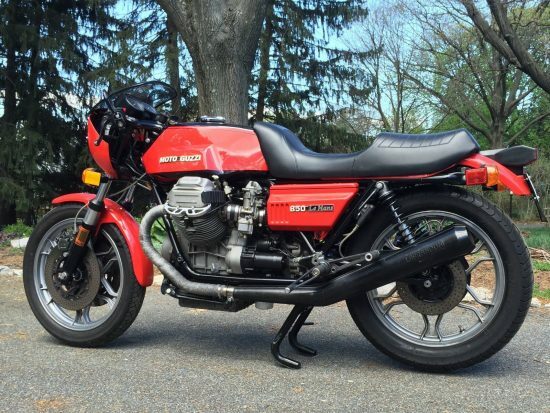 And Guzzi was forward-thinking in terms of safety as well: the Le Mans featured their simple but effective linked braking system that was used up until the 1990s. The front brake lever operated one front caliper, while the foot pedal used a proportioning valve to distribute power between the second front and the rear caliper. The Le Mans is definitely an acquired taste, with the noticeable shaft-drive effect, but is a very rewarding bike to own. 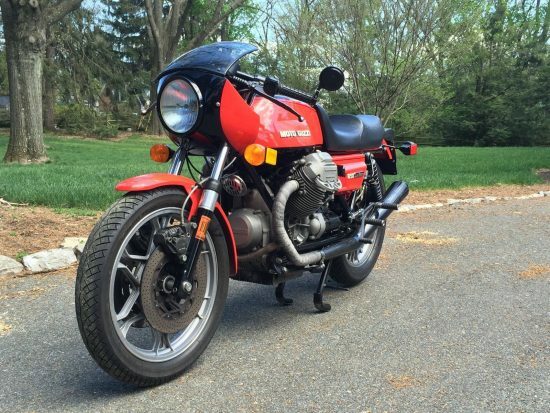 I have had the pleasure of owning this bike for the past 15 years. This bike runs and looks great! It handles likes it on rails, brakes with the best of them and has tremendous acceleration and power. Time for someone new to enjoy this fine machine. Bidding is up to $10,000 which, frankly, seems to be on the low side for these. 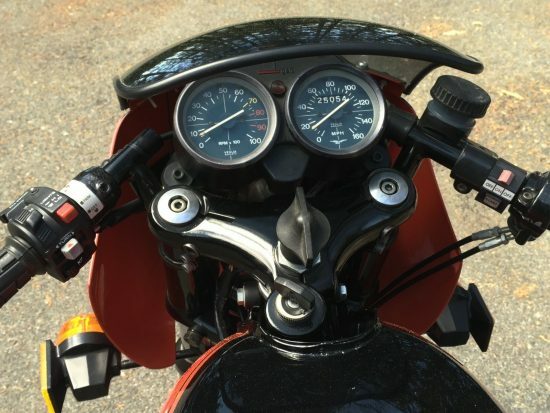 I can remember when, just a few years ago, they were selling for about half that… Happily, the bike even features the European-style bikini fairing with the flush-mount headlamp. American units had an ugly, jutting unit that projected out beyond the curve of the fairing, looking more like a train headlight than something that belongs on a sleek sportbike. If you’ve never noticed how ugly the American version is, I apologize in advance: its’ one of things that, once seen, can never be unseen… This may not be the original part, however, since most I’ve seen feature a bright orange vertical “safety stripe” for improved visibility. Not sure how effective it is, but it does look cool. The stepped seat is also a non-standard item, which is no surprise since the closed-cell foam originals rarely survive. That is one ugly custom seat.